Seems like this winter has had it's share of a few decent cold snaps around the states. Did the snow make it to the Ben Lomond area during the last event? I was hoping for a bit of triggering as the front arrived as our temps are fairly warm now, around 24c+, just warm enough to cause a little storm action. I hope it's a decent system, though GFS is a little weak currently, praying it might improve a little over the next day or two! 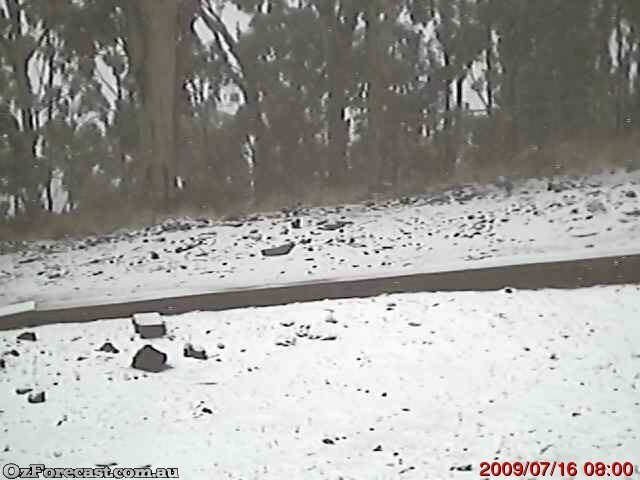 Hi Shauno, was a very light dusting up this way on 10th June - Armidale area but no reports from elsewhere on the Northern Tablelands. Been a struggle to get any significant cold and moisture to far north this season. The frontal cloud band has just reached town (2pm EST) and there does appear to be a little convection taking place as there are a few towers sitting to our W-SW now. Temps are nice and warm currently at 26.4c. Not sure how the jet moving up from the SW will affect this system? Just hope it doesn't weaken the updrafts and knock the tops off before anything can take place. I'll keep an eye on things this afternoon. I'm keeping an eye on things in southern VIC tomorrow (13/07/09), as the BoM forecast is for the chance of thunderstorms. I haven't been able to get much of the way of storm pics since I've had my camera, but it is only a matter of time before a repeat of SA's waterspout/landspouts could occur over here. Anyone interested in weather and non-weather pics from me, please log onto my Facebook wall (if you have facebook) - I have some there now. Been a bit showery in Adelaide this morning but we are now getting some small hail falling. Looking at the radar we are getting the southern end of the rain band here in the CBD. A few showers coming through, feels like a real cold wintery day. Tomorrow and Wednseday the chance of a thunderstorm which would be great! Potential remains good for the NSW Northern Tablelands (NTs) with a little frozen stuff likely to have fallen last night during the rain band. Had a report of 2 degrees and some possible sleet from Guyra. Armidale and Glen Innes had temps around 5 with rain at the same time. Latest GFS suggests the NTs could see some snow tonight, Wed morning, Wed evening, Thurs morning and Thurs evening. 850 hPa temps and heights are just low enough for areas above 1300 metres in elevation but with so much moisture progged, we'll have to see. The Armidale forecast max for Wed and Thurs in now 8 which is certainly more encouraging. Showers, mostly in the west. Possible small hail and thunderstorms. Sleet or snow on higher ground. Moderate to fresh westerly winds. Isolated showers, tending scattered in the west. Snow possible on higher peaks. Southwesterly winds. snowfall.... i was thinking maybe Wednesday evening into Thursday. Its great there is moisture about, which is mostly always the issue on the NTs. It has the elevation. ALL the 3 models are forecating prep. It is a very chilly day, they should get a good dumping on the mountains today for sure! A few storms popping up around here. Well, another wipeout! No storms for me again - but some cloud did roll in on Sunday arvo with a few storms embeded in the North Country region - mostly with a few c2c's around the Seymour area - but nothing for me and my camera - I might wait until spring when the storms are due to rise again! We copped some showers and hail overnight and a few icy cold showers around this afternoon. Tonight's forecast is for showers, hail and local thunder, but we will see. Significant snow has fallen on Mt Kaputar. There was a light fall at 3pm yesterday followed by a much heavier fall starting around 4:45pm. Snow continued to fall through the night and there has been some additional flurries so far this morning. I have to work but some of my friends might go up to get some photos later today.